VirusTotal — launched in 2004 and acquired by Google in 2012 — is a free and popular online service for security researchers and Hackers that lets you upload files to check them for viruses. VirusTotal scans uploaded files with more than 55 different Antivirus products and Online scan engines to provide a combined report on the results. VirusTotal also runs certain 'Windows PE files and Android apps' files in the Sandbox, a controlled research environment used for malware analysis. According to the recent announcement, VirusTotal will also be able to execute suspicious Mac executable files inside its Sandbox environment to check them for viruses. "We are happy to announce equal treatment for Mac OS X apps. Files scanned that are Mach-O executables, DMG files, or ZIP files containing a Mac app, will be sent to the sandbox to produce behavioral reports." Karl Hiramoto, Technical Account Manager at VirusTotal, said in a blog post. 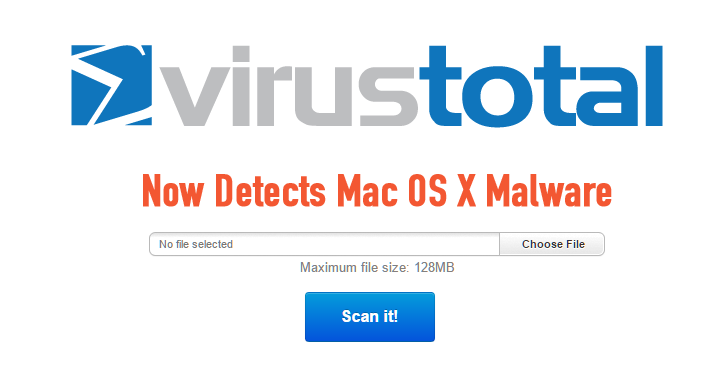 Mac users who wish to scan any file for detecting hidden threat can do so on www.virustotal.com website, or with an app or via the API.